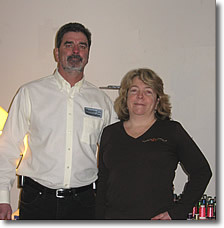 Christine and Keith Kling’s philosophy about their business is straight to the point: Provide top quality products and excellent customer service. The Klings feel that Screen Printing, Embroidery and Quilting are very personal and that delighting the customer is their number one priority. The Klings’ background is part of the very special make-up of SuperStitchin LLC. Before stitching full time, Christine spent several years working as a computer programmer and then later as a Decorator Coordinator. This unique blend of experience makes for an excellent technical skill base coupled with creative flair. Christine started using these talents to make quilts for family and friends that quickly became family heirlooms. Her passion for embroidery coupled with the acquisition of a state of the art embroidery machine allows her to create a myriad of items ranging from personalized shirts to unique gifts. Keith Kling’s 20 years of experience as a homebuilder gives the company a strong background of financial and marketing expertise, plus a keen understanding of quality control. He has the same passion for screen printing that he had for carpentry. Together, the Kling family works as a team to insure high quality products, fair pricing, and a focus on delighting their customers with Screen Printing, Embroidery and Quilting, and Promotional Items.